The Digital Arts Research Center -- "the DARC" -- is a new 25,000 square foot building overlooking the Monterey Bay. It is the home of the MFA Program in Digital Arts and New Media, and parts of the departments of Art and Music. The building opened in April 2010. The Dark Lab is a 40’ x 40’ performance space with 30’ ceilings. It is designed with numerous wire raceways under the floor and in the walls, containing wiring for lighting, sound, video and data. All wiring is accessible at many points throughout the space, and runs to a theatrical control booth and other control points. The lab has standard fixed theater lighting as well as robotic, programmable theater lighting. It is outfitted with sound for theater including 8.1 Surround Sound, a long-throw theatrical projector, smaller projectors and work lights. 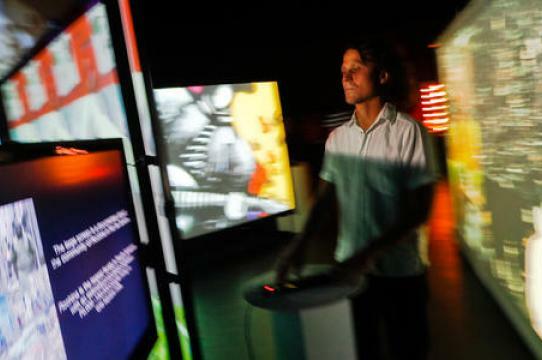 Top: "Roda de Video," interactive video installation in the Dark Lab by Drew Detweiler (2010). The Prototyping Lab, currently spread over multiple spaces, consists of an Epilog 36 EXT Laser Cutter, Formech Vacuum Former, Ultimaker 3D Printer, Makerbot Thing-O-Matic 3D Printer, Tormach PCNC770 CNC Mill, Sherline desktop CNC Mill, Grizzly Manual Mill / Drill Press, Mold Making & Casting Equipment, various hand & power tools, electronics workbench, and a variety of other tools. Students use these tools for the creation of 3D and installation artworks. DANM labs in the Digital Arts Research Center (DARC) are used for research support and occasional special events. These labs are primarily designed to be used as research spaces in the practice of digital art and new media. We do not schedule classes in these labs. They may be booked for special events that support DANM’s mission of digital arts and new media graduate education via the DANM Lab Use Request Form.